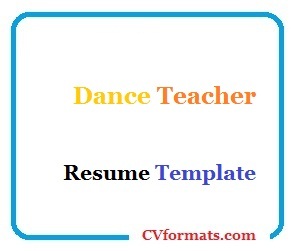 Mentioned is the way you can write Dance Teacher Resume Template . People looking for jobs can easily download these Dance Teacher Resume Template in word or pdf format or just view it online to copy and paste. Cover letter of Dance Teacher Resume Template is also available. Just change the name , address , qualification and experience and your Dance Teacher Resume Template is ready. To obtain an employment as dance instructor with the well recognized dance class or theater. Assessed students’ dancing abilities and created individual training techniques and methods to enhance each one’s special gifts. Planned dance programs and dance revolution events to expose the dancers and provide a venue for the kids to show their talents. Conceptualized, explained and demonstrated dance choreographies, formations, facial expressions, bodily gestures and techniques. Advised students regarding proper gestures, feet formation and angle, correct postural alignment, timing and dance techniques to prevent injuries. Helped students feel appreciated and rewarded for sharing their talents and having the proper discipline. Researched constantly on the latest dance trends, moves, rhythm, music genre and artists. Handled the school’s dance classes which involves all high school years starting from Freshman to Senior classes. Taught proper dance steps and techniques for each dance routine. Choreographed, demonstrated and performed the dance moves correctly for the students to follow. Introduced and implemented proper techniques to be observed while dancing, which involved warm-ups and stretching prior to dance, to prevent injuries and help condition the body up for safe dance moves. Graded and evaluated student performances by having individual recitals at the end of each term.